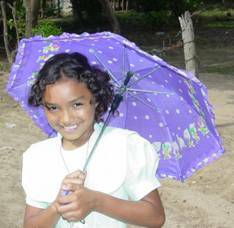 Short-term Volunteer Mission Projects designed with a clear focus on church planting in Honduras. “How shall they preach unless they be sent? Just as it is written, ‘HOW BEAUTIFUL ARE THE FEET OF THOSE WHO BRING GLAD TIDINGS OF GOOD THINGS!’” – Romans 10:15.
edicine – the magnet that draws people to Christ. 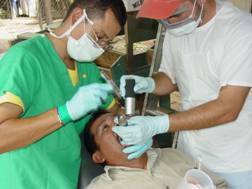 I cease to be amazed as to how the Divine Administrator of Missions, the Holy Spirit, guides and directs us to locations where we conduct medical-dental-evangelism caravans. When I look back on a site location it is obvious that the Lord was leading us step by step. We conduct around twenty-five worship services during each team visit. Every patient must attend a worship service before he can see a doctor or dentist. 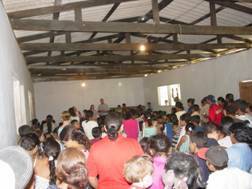 On this trip 175 professions of faith were made in the public worship services. A group of Christians with a Bible background had been praying for months that God would provide them with pastoral leadership. 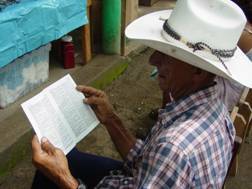 The Latin-American missionary who started a church had been to transferred to Guatemala. This group of believers told us they would be glad to bring their families and help us start a Baptist church if we were serious about starting one. These believers who are hungry for God’s Word along with those who responded this week are the nucleus for a new Baptist mission. 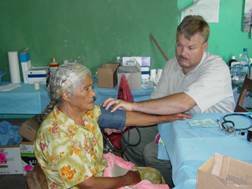 The Tennessee, team served in Zapotillo, El Paraiso, Honduras, July 13-18, 2003, totaling $105,000 in free service.